This is a question I get asked often. 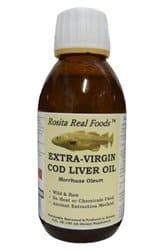 There are so many cod liver oils on the market, but many of these brands only use about half cod liver oil- the other half is made up with synthetic A and D! 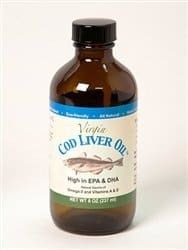 Yuck-that defeats the purpose of using cod liver oil if half of the nutrients are man-made. So let’s talk about why cod liver oil can be so amazing, and which brands are actually great. Autoimmune disorders, leaky gut, inflammation, ATP energy production, food intolerances, and more are connected with vitamin A. Retonic acid impacts about 500 different genes!! This article is probably one of the best I have ever come across. Vitamin A is so important for our healing process, but we do need to go slow with it and support our livers! Vitamin A is a crucial nutrient needed to heal from copper dysregulation. It is a prime part of creating ceruloplasmin. (Source-PubMed) Most A is stored in the liver so blood tests can’t be very effective in telling us our A stores. Low ceruloplasmin in the blood and low potassium on the HTMA are good indicators of an A deficiency. One of the BIGGEST lies we have been told is that beta carotene is the same as vitamin A. While beta carotene is an important nutrient, it has to go through a process to be converted into retinol. In order to make this conversion we need a healthy gut, healthy liver and gallbladder (bile flow is the KEY), and certain enzymes and nutrients (like zinc). From this study, “β-Carotene is absorbed from the intestine and is converted into vitamin A only in the presence of bile acids.” Using something like Cod liver oil that has retinol helps you get the REAL vitamin A that you need, because we cannot depend on the beta carotene converting. There is a lot of hype about vitamin D. So many people push high doses of it without understanding that we are we are meant to get D from the sun and in small amounts from food. Period. You CANNOT bottle sunshine and I find it preposterous that this supplementing fad has continued for so long. Cod liver oil is one of the oldest and most effective ways to supplement vitamin D. We need a lot more vitamin A than vitamin D, and cod liver oil provides this balance. We also need healthy livers to utilize both A and D. This is why liver support is so crucial for healing! We need these fat soluble vitamins, but we cannot use them properly with sluggish livers. Made from wild Norwegian Arctic cod from the purest sea water. Processed within 24 hours in effective and gentle manner. Separated from fresh cod fish livers using cold pressed purifying technologies without the use of chemicals. Regularly tested for freshness and purity by an independent, FDA-registered laboratory. Proven to be free of detectable levels of mercury, cadmium, lead, PCB’s and 28 other contaminants. Available unflavored or with a hint of organic peppermint oil and/or lemon oil. Perfect Supplements has both of these cod liver oil brands: NutraPro and Rosita’s. They also have NutraPro’s Butter oil to help increase absorption of the CLO! Use my code SASSY for 10% off! They also offer free domestic shipping for orders over $99 and have a money back guarantee on unopened bottles of the CLO. My third choice for CLO would be Nordic Naturals Artic (without the added D). You can usually find this one at Vitamin Shoppe easily. I’ve also seen good things about Dropi as well. My absolute favorite is the NutraPro because it is the best value and it is pretty potent!